Phantom Thread is, if Daniel Day-Lewis is true to his word, his final film. Now, I confess that I have never been as enamored of Day-Lewis as most. I still think his turn in There Will Be Blood was wildly self-indulgent and yes, hammy. I don't think Lincoln or him in it were terrible, but I also was a bit taken aback by all the 'he was the Lincoln' talk either. He was brilliant in Lincoln, but I think Henry Fonda and possibly Raymond Massey might still hold up equally if not greater as our 16th President. Even now, I think 'Sam Waterston' when I think of Lincoln, but I digress. Phantom Thread is an elegant swan song for Day-Lewis if he has indeed retired. Sumptuous in its setting, it captures the artist thoroughly devoted to his craft and the perils for anyone who gets in the way. In the 1950's, haute couture desire Reynolds Woodcock (Day-Lewis) is the ultimate in glamour and elegance. His House of Woodcock dresses the most sophisticated of women: royalty and women of wealth. The confirmed bachelor has nothing but his work, aided by his sister Cyril (Leslie Manville). As such, it is a surprise to Cyril and indeed to Reynolds that he soon is besotted with Alma (Vicky Krieps), a waitress he met while on a rare holiday. Alma is nowhere near elegant, sophisticated, or wealthy. She isn't even ravishingly beautiful: Reynolds notes she has no breasts to speak of; yet Reynolds has found in Alma a soulmate. Perhaps one should point out that 'Alma' means 'soul', at least in Spanish. Alma soon becomes his muse and mistress, even if the fastidious Reynolds can find Alma's manner a bit more rustic (the normally quiet breakfast is interrupted by Alma's loud buttering of her bread). Still, he is in turns fascinated and irritated by her. She wants to be a bigger part of his life, but as an artist he needs to follow his own path, which sometimes does not include her. Things come to a head after Alma sends everyone away for the night so that she could spend a quiet surprise dinner with Reynolds, down to making the meal. Over Cyril's warnings that her brother does not like surprises, Alma goes forth, only to end up with Reynolds snapping his way through the meal. Things become dangerous when he becomes violently and suddenly ill the night he inspects the wedding dress for a Belgian princess, a favorite client of his. This illness may not be as innocent as it may seem, just saying. Cyril is forced to make the couture house stay late to repair the damage Reynolds has accidentally caused the dress, while Reynolds hovers between life and death. Alma stays to nurse him through it, and realizing he cannot live without her, he asks for her hand, and she accepts. Despite their marriage and apparent bliss, things still pretty much are the same, with him still distant from Alma. She wants to go and celebrate New Year's, he'd rather stay home. Again, they seem close to breaking, and again the idea of his becoming ill come to Alma's mind. All she wants is for him to be vulnerable and let her in. Perhaps he will, or perhaps not. Paul Thomas Anderson, the film's writer/director, is well-regarded, but I find him an acquired taste. Of the PTA films I've seen (The Master, There Will Be Blood) I find the lack of an ending, or at least a definitive ending an Anderson trope I cannot get behind. Anderson's films, at leas of the ones I've seen, don't actually end, they just stop. However, I sense that Phantom Thread is a bit of a departure for Anderson, at least when it comes to the style. The film is very lush, down to Jonny Greenwood's score, which given his work in the two previous Anderson films I've seen, is also a departure but perfect in tune with the setting (no pun intended). Looking at Day-Lewis, I find that he is perfect in his role as the brilliant and not-totally temperamental but aloof artist. Reynolds Woodcock is a man who seeks perfection at all costs, who bristles at the idea that people, even wealthy yet highly insecure people such as Barbara Rose (Harriet Sanson Harris in a small but strong performance) could alter his vision. The scenes with Barbara Rose, I think, indicate Anderson's overall message about the struggle to create art and especially when it comes to art versus finance. Woodcock does not want to go to Barbara Rose's newest wedding, but as Cyril points out, Barbara Rose pays for the house. He dislikes how Barbara Rose pulls down the collar to his newest creation, and in a rare moment of open rage, demands that the drunk and passed-out Barbara Rose have his dress taken off her. The idea that someone, anyone, would sleep in one of his dresses is appalling, no matter how much money they have or even that technically, the dress is no longer his. Krieps is also strong as Alma, the woman who wants to be loved by this fascinating man but who is also not an artist and cannot fathom the artistic temperament. She knows herself to be not a great beauty, but she also has her own fears. She says something to the effect that she is waiting for him to get rid of her at the tense surprise dinner, admitting to a kind of sense of inferiority. It's curious that Manville, while good as the curiously named Cyril, did not have a major role to play, coming and going as needed. Mark Bridges is almost a lock for Best Costume Design, given not only how sumptuous the clothes were but how important and integral these designs were for the film. They are not only beautiful, but in keeping with the designs of the Eisenhower era of fashion. They are both elegant and appropriate to the times. 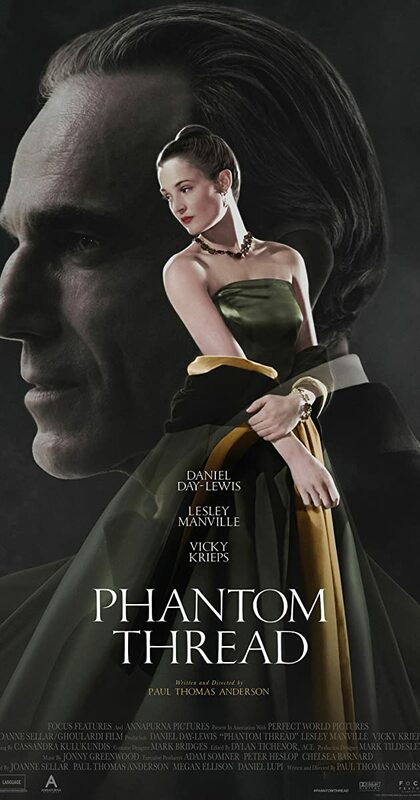 Everything about Phantom Thread is très élégant, but don't call it 'chic', a term Woodcock detests.